I'm a big fan of the Apple keyboard, so I was pretty interested in the K760; in fact, it seems to have been designed to replicate the experience of using the Apple keyboard as closely as possible. The keys are very similarly-sized, the angle and height are practically identical (as you can see below) and the key layout is mostly the same. Where there are differences, they're for the better... mostly. Chief among these is the solar panel that dominates the top section of the keyboard. Logitech says that it'll charge from any kind of light - direct, indirect, solar, lightbulb - and when fully charged it'll work for up to three months in total darkness. The keyboard makes use of an F key and the power light to show whether you need to expose the panel to direct sunlight; in my sunny office during the past two weeks, the light has never shown anything but green. This is pretty refreshing in comparison to the Apple wireless keyboard, which seems to chew batteries pretty hard. Below this is the F-key row. Here we find another few changes, specifically to the function of the F-keys. On an Apple keyboard, the F-keys provide access to brightness, Exposé, Launchpad, iTunes controls and volume. Logitech have included all of these bar Launchpad, but added a few others. F1, F2 and F3 control Bluetooth pairing - you can pair the keyboard with up to three Bluetooth devices and switch between them with one tap of a button. So you could be working away typing up your TPS reports on your Mac, then respond to a tweet on your iPhone, then change the music volume on your iPad - all without lifting your hands off the keyboard. 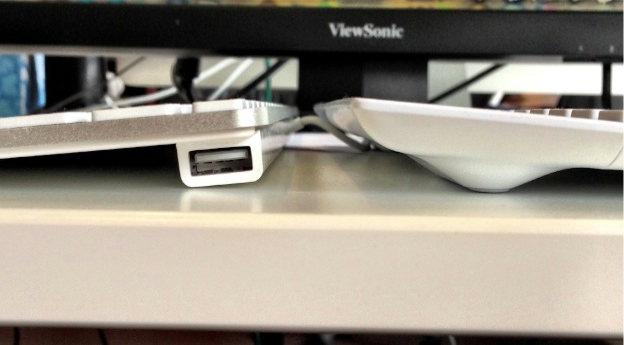 The initial pairing is quick and painless, as is switching between devices. To facilitate the use of iOS devices, the F5 key functions as the iPhone/iPad home button. This works exactly as it would on an iOS device. Double-tapping it brings up multitasking, tapping it when at the main homescreen brings up Spotlight, and so on. Below this, of course, we come to the actual keys. These differ from the Apple keys in their slight concavity and a tiny increase in height (which leads to a corresponding increase in travel). The concave keys are a subtle but welcome improvement, but the actual typing experience is spoiled somewhat by the amount of noise the keys make. There's a definite solidity to the Apple keyboard that the K760 lacks, resulting in a slight rattling noise as you type. Though perhaps ironically, it would hardly be noticeable at all if it weren't for the comparative silence of the Apple keyboard the K760 resembles so closely. 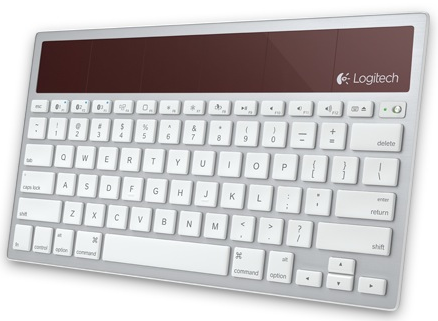 Overall, the K760 is a no-brainer upgrade for anyone who's sick of replacing batteries on the Apple wireless keyboard, or who has a Mac and one or more iOS devices on the go at once. Toby Nieboer is the lead developer at a Melbourne based media and digital agency. In his spare time he follows the NFL and watches far too much TV.